Weathering the rain and cold, the hills and the valleys, racing against the clock and crossing the line at the Place Vendôme, Mar Gonzalez, photographed by Benjamin Kanarek for ELLE, wins her Tour de France wearing Haute Couture on her Chanel bike. Haute Couture is a mix of Art, Sculpture and Architecture. It couldn’t have been a more fitting occasion than to celebrate these fine arts by blending them together into one grand expression. 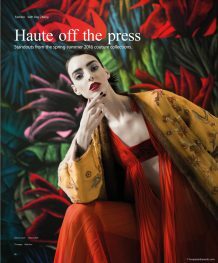 Model Dajana Antic, plays her part as the muse in this editorial for SCMP Post photographed by Benjamin Kanarek. Mysterious corridors and ethereal ambiance surround Tako Natsvlishvili, featuring the vivid colors of the Spring-Summer Haute Couture gowns. 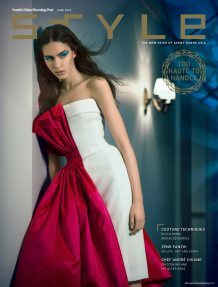 The “Shining” of the most undeniably magnificent pieces by Benjamin Kanarek for the Cover Story of SCMP Style magazine. On a steaming hot 40° centigrade day in Paris, Daniela De Jesus Cosio, Mexican Supermodel and the face of Maybelline and Clarins turns up the heat in Hot Couture for Elle Vietnam, October 2014.